How To Delete Duplicate Files From Android | GUI Tricks - In Touch With Tomorrow! How To Delete Duplicate Files From Android - GUI Tricks - In Touch With Tomorrow! These days you can find smartphone which comparatively high storage capacity. You can store your world in them, pictures and videos of your dear ones, important documents, Music and many other things. No matter how huge your internal storage is and how much capacity your memory card has. After a point of time you start realizing that the space is not enough. This make you to think for many other options to get the extra space on your smartphone. some of these options are to buy a memory card with higher capacity. To back up and delete data from your phone. To reset your phone completely. There is another way to make room for new files which is by deleting duplicates. By using this method, you can get extra space on your device practically by not deleting anything important. 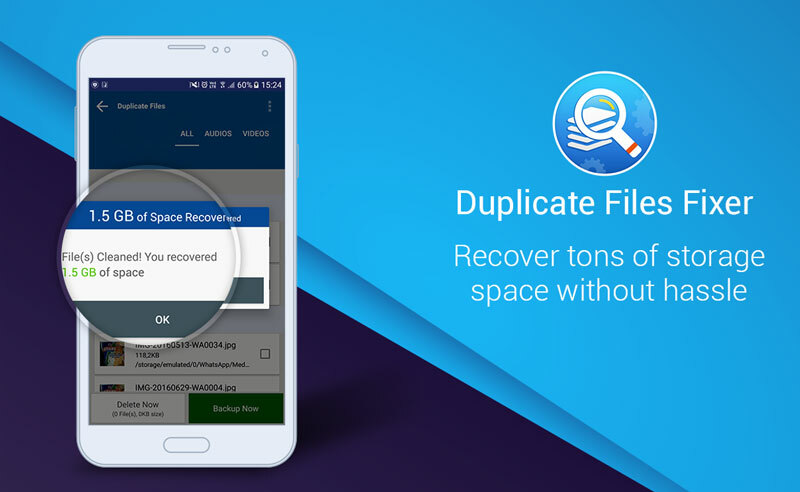 Let us find out how you can find and delete duplicate files from android. If you frequently share images and videos from your gallery on WhatsApp with your friends then a copy of the same is there in WhatsApp media. Locate WhatsApp folder using file explore on your smartphone. then go to media. Here you will find all the media files you have sent and received over the WhatsApp. There will be separate folders for sent and received files. By clearing WhatsApp media, you can spare memory in GBs. If you have sent these files from the gallery of your phone, then these are just duplicates. We love to click photographs from our smartphones and more than this we love to add amazing effects to them by using applications. Some of these applications do not alter the original image when you click on save they save an edited copy of the same image. In this case if you do not require the original image and you are happy with the edited one then you can proceed further to delete the original image. In some of the smartphones when HDR mode is turned on then camera saves two images by default on is in HDR and the other one is default. You should always choose one image which is looking better and delete the rest then and there otherwise after a period of time you will find your device overloaded with similar images. Well it is always a simple and clean way to perform any task there are lots of third party applications on Google play store they claim to remove duplicates from your device but I have found Duplicate files fixer app from Systweak better than any other application. The application is very user-friendly it gives you several options to find and remove duplicates. The best thing I like about this application is that it is efficient enough to find duplicates based on the content. That means if you have duplicates with different names then too application will find them. You can also choose from 4 options to delete duplicates. You can download the application for free from Google play store. This is how you can increase memory of your device without spending money or without compromising your favorite music or videos. Just get rid of duplicate files and enjoy your smartphone at its best. Thank you Raghav for commenting.